Thread: Damage calculation changed overnight? I'm currently working on a formula for a simulator, especially double-checking if we implemented the newly introduced Hurricane buff correctly. Therefore, I played an "Unknown Regions" adventure and "The people of the mountain" yesterday, to get an active Hurricane buff in combination with specialized weapons and slippery ice. I wrote down all the important minimum and maximum damage numbers from the different units and startet my calculations. Today, I finally worked out a formula that fits all the numbers I wrote down and I wanted to start some investigations regarding battle fenzy. But first thing I noticed, the minimum and maximum damage values from almost all units differed from what I wrote down yesterday. Here is a screenshot from my sheet with the numbers: (I did not restart the adventure, to get the full numbers of every configuration. I just wrote down the 'new' numbers for the configuration with active hurricane and specialized weapons). I did check the forum and homepage for news about an update, but I could not find anything. So, I'm currently unsure what happened here. Maybe I was already half asleep and wrote down the wrong numbers, or there is a bug in displaying the numbers, or the damage calculations have been changed. Does someone else notice this or has any informtion about it? The way we described in the past how different damage modifiers are applied is different than it actually works in the game for this general. To avoid changing the current mechanic and therefore potentially rendering tactical maps, battle calculators etc. wrong under most circumstances, we decided to leave the mechanic untouched and instead explain how it actually works. Maybe not completely. Slippery ice, Specialized Weapons, and Battle Frenzy are handled differently. Once the absolute and relative damages are added, Slippery ice is multiplied. 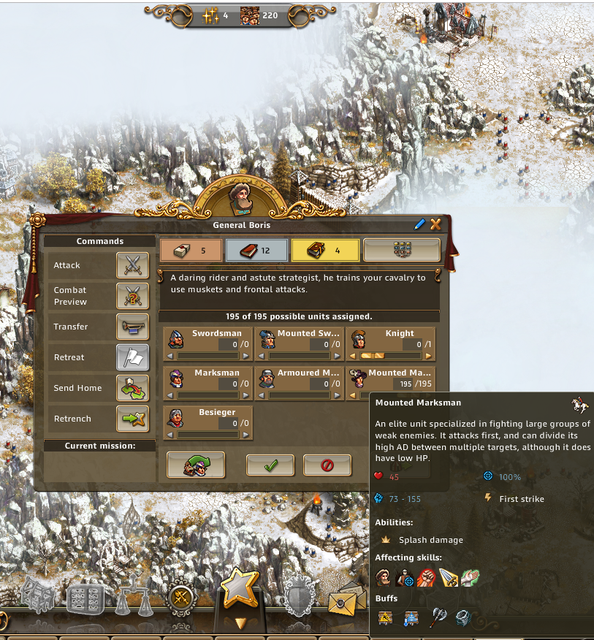 Afterwards, Specialized Weapons is added, unaffected by Slippery Ice and finally Battle Frenzy is multiplied. 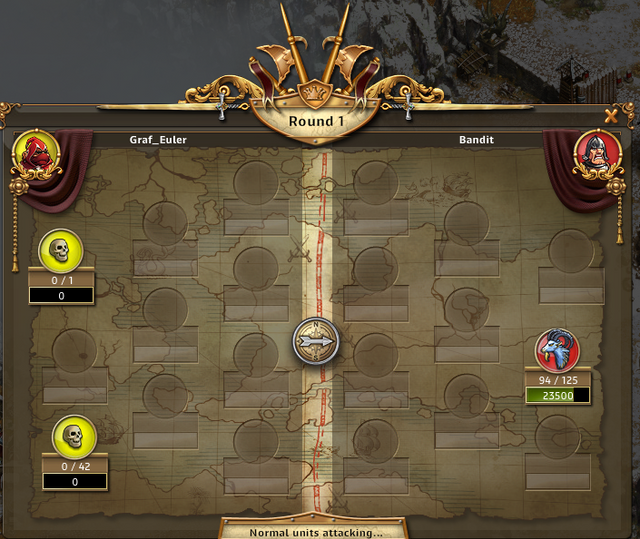 120 + 10 + (120 * (0.1 + 0.1)) = (154 * 0.85 + 120 * 0.05 ) * Battle Frenzy = 136 in the first round, so without Battly Frenzy. Anyway, I got some news about the damage numbers. This is what I reported yesterday. Today, I restartet the adventure, because these damage numbers were driving me mad. I now started an attack to see if its maybe only a display error. I found an camp with 125 Frost Ibex and startet an attack with Boris and 42 Mounted Marksman. Since Boris is skilled with Master Planner, the Marksman should always do maximum damage. We killed 31 Frost Ibex. So, the Marksman are really doing 155 damage. I start a new adventure tomorrow and repeat this attack with 152 display damage, to see if the 152 damage may be a display bug. Here we are again. Okay, I repeated the experiment today and I can say, the damage really changes! I did change the attack a little, so Boris is now attacking a different enemy unit that the Mounted Marksman. 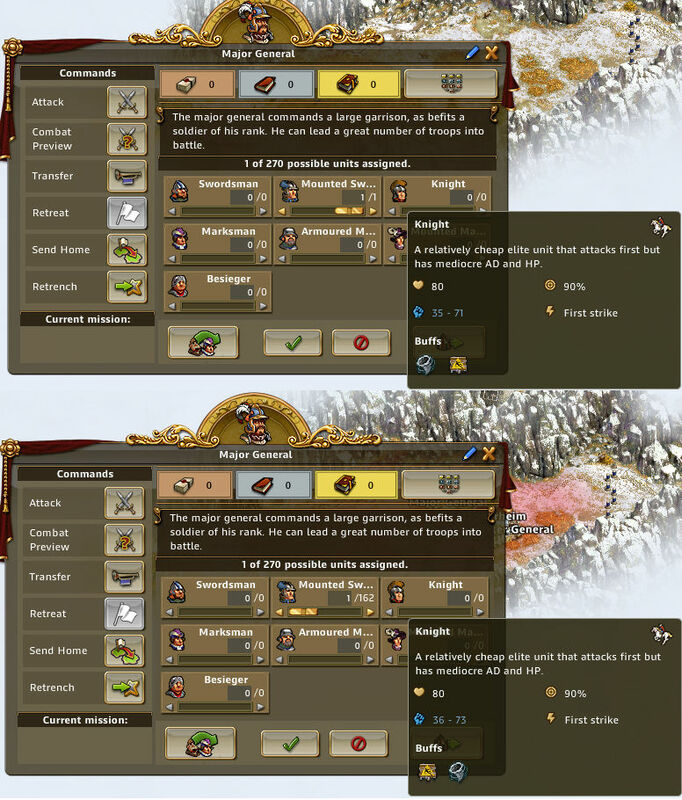 As we can see, 25 Ibex have been killed by the Marksman. 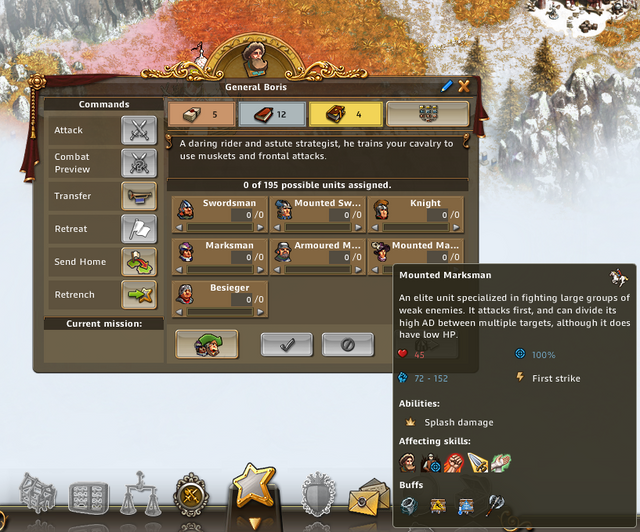 By the way, although I'm only reporting about Boris, this change in the damage values apply to all generals. The only difference I can spot here, is the order of the damage modifiers in the mouse over. 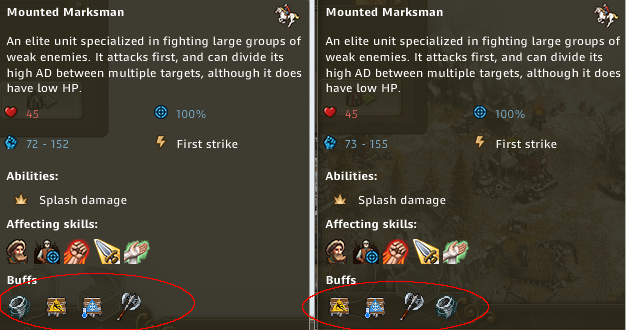 (100 + 50 + 3) = 153, the base damage of the Mounted Marksman with Boris. Maybe this topic need to be move to the Bugs section? Thank you for this information. I forward it to our QA to see if we can find out what is happening there. Yeah the buff order and values change. I went to check my adv that I left open over night and Knight damage went from 35-71 to 36-73. One question, do you experience the issue only on the test server, or did you experience it on the live server, too? Only tried it here at test as it would be too expensive and risky at live server.